The March 30, 2014 New Moon catalyzes an unprecedented lunar cycle providing opportunity for revolutionary change in many facets of our personal lives and in the world. 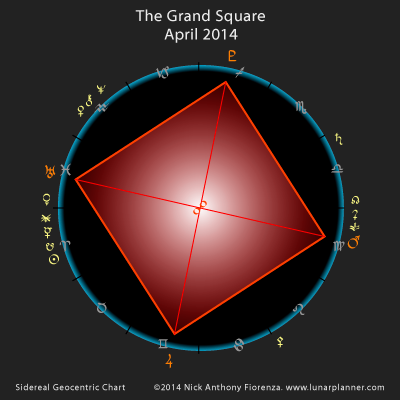 The main event occurring in this lunar month is the Mars-Jupiter-Uranus-Pluto Grand Square. This Grand Square gateway is intense, challenging and deeply cathartic. It is a doorway that requires a decisive choice to leave one way of being, to live the wisdom gained from the past, and to morph into a new way of being and into a new world paradigm yet to unfold throughout the remainder of the 2010s. This lunar cycle is also highly inspirational to mobilize and emerge into new vistas of creative participation. The Sun-Juno conjunction occurs on April 11, hours before the Gibbous Moon, also as Venus conjoins Neptune. This marks the mid-point of vision and realization in the current Earth-Juno synodic cycle that began on August 3, 2013, presented in the July 8, 2013 Lunar Planner. The Sun then conjoins Eris hours later on April 12, just after the Gibbous Moon. Slitely later, on April 13, Juno conjoins Eris. This new Juno synodic cycle theme can express in a variety of ways. It can impel the formation of new bonds and partnerships in business. It can impel partnerships in the areas of publication of information and of a social nature. It can inspire the concretization of ideas and thoughts from multi-disciplines in the fields of science and history. It motivates partnerships of all types to work for a greater common good, and to become responsible to provide the prosperity and security required for a nurturing environment for home and families. This is a shift from the exclusive self-focused survival of the fittest mentality (what can I get from another) to one that is inclusive where the thought becomes what can we mutually provide for one another. Also of pertinence is the new and recent Juno-Uranus 4.5-year synodic cycle (and their conjunction) that began in the previous lunar cycle. A Juno-Uranus synthesis in general can be about making radical if not spontaneous changes in relationships and partnerships of all types. It may be about partnerships breaking apart and new ones forming, or it may be about existing partnerships breaking away from the conformity of the past and exploring new territory and new frontiers. It may motivate partnerships to evolve in new or unconventional ways and that create innovative ways forward. Here in sidereal Pisces, this can be of an emotional or spiritual nature, but may also involve new technologies or modalities that make our experience more humanly palpable and intuitive. With these stars, it may motivate revolutionary breakthroughs through past restrictions to achieve a greater level of freedom from any variety of dependencies, also those of a financial nature. This may involve much inner work in our relations, learning to interrelate in new and innovative ways, which can ultimately be quite rewarding. The Time of Global Change is at Hand. for those who make the inner changes required to externalize a new world paradigm.